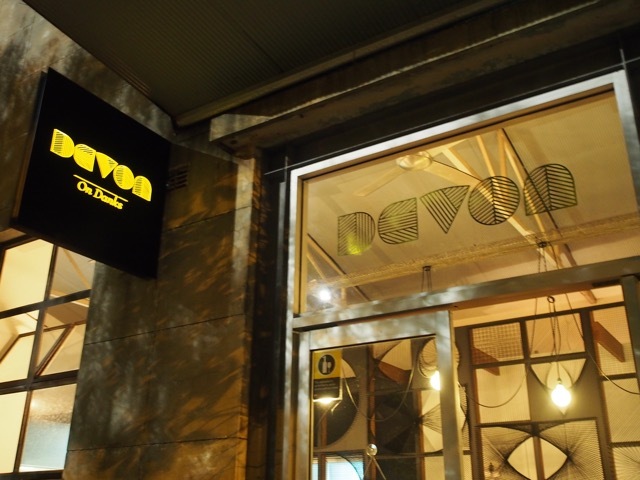 If you are a Sydneysider, you have probably seen thousands of instagrammed photos of the beautiful Asian-inspired cronuts, donuts and soft-serve ice-creams that Devon on Danks and the original Devon Café in Surry Hills serves up for breakfast and lunch daily, among other delectable dishes. 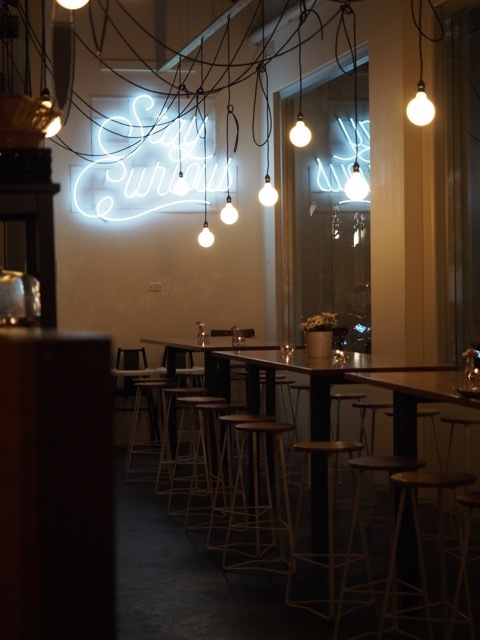 It’s not as well-known that come Wednesday to Saturday evenings, Devon on Danks morphs into Devon by Night, a bistro serving east-meets-west small plates dining. 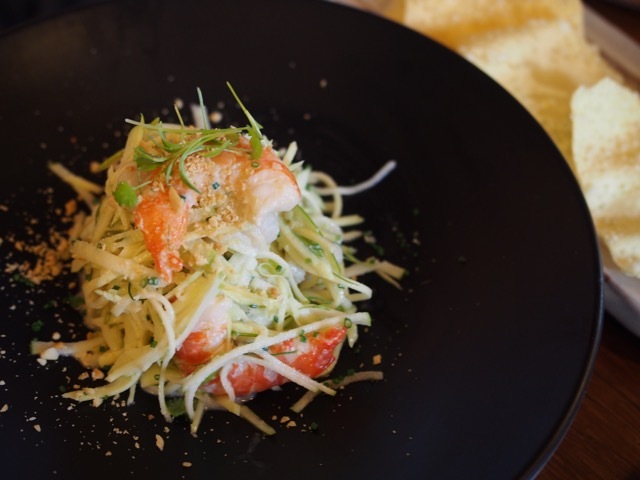 It’s the perfect showcase for its very talented Penang-raised chef Zacharay Tan. When BL and I came here with friends a couple of months ago (yes, I have taken blog posting tardiness to a new level), we parked several blocks away expecting lots of traffic. Only to find… There. Was. No Traffic. We could have parked 20m down from the door. Devon on Danks is located in a corner by some commercial buildings, a church and not much else. In the evenings, you can nearly see tumbleweeds. Okay, not really, but for Sydney standards, this is a quiet street at night. 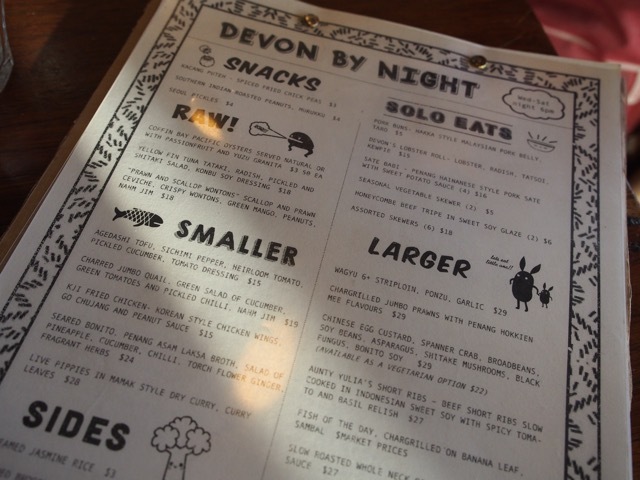 The Devon by Night menu is divided into snacks, raw, small and larger plates and individual servings (solo eats). There is a deceptively large menu to choose from, and we pondered for a long while. I was chuffed to see kacang puteh (chickpeas) on the snacks menu. Brings back memories from home. I used to buy 20 sen cones of steamed kacang puteh from a hawker outside the primary school gates. 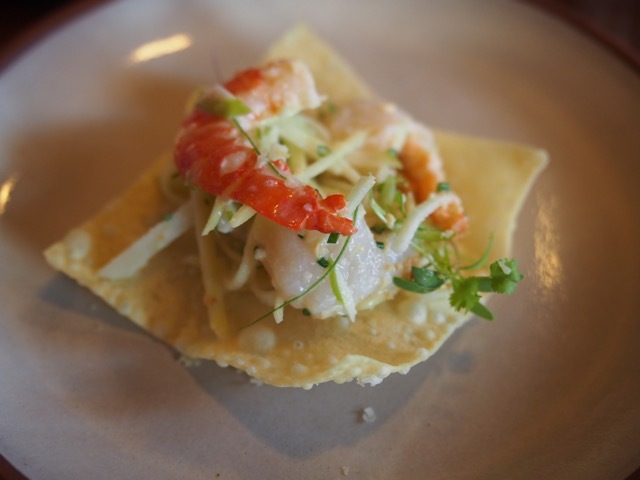 For starters, we had the prawn and scallop wontons ($18) which are scallop and prawn cerviche on crispy wonton with green mango, peanuts and nahm jim (Vietnamese dipping sauce made with garlic, fish sauce, lime juice, sugar and fresh chilli). I had these in Vietnam and loved them. The Devon by Night version was fresh and delicious. I can’t go past a pork bun ($5 each). 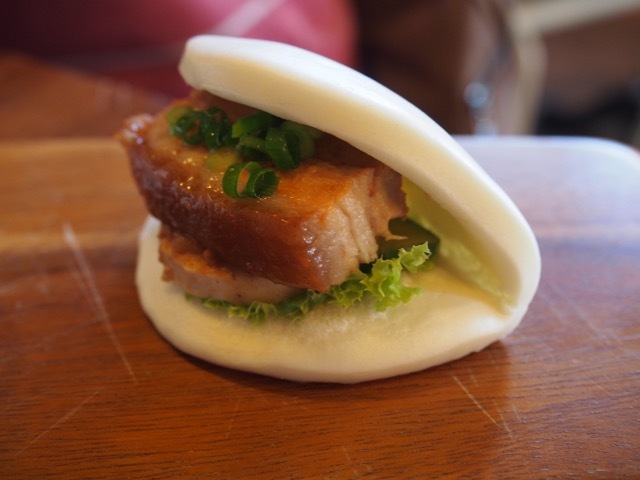 This is Malaysian Hakka style braised pork belly, taro, pickled cucumber between fluffy steamed buns, and was very good. Sour, sweet, salty flavours and chewy, crunchy, soft textures. All in one bite. 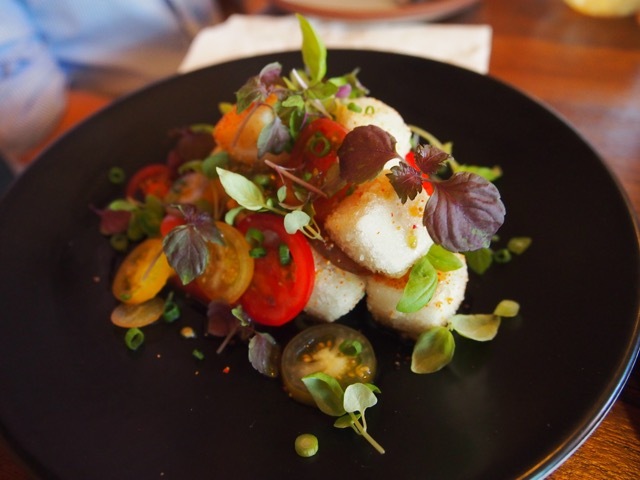 Our one vegetable option was the agedashi tofu with sichimi pepper, heirloom tomato, pickled cucumber and tomato dressing ($15). 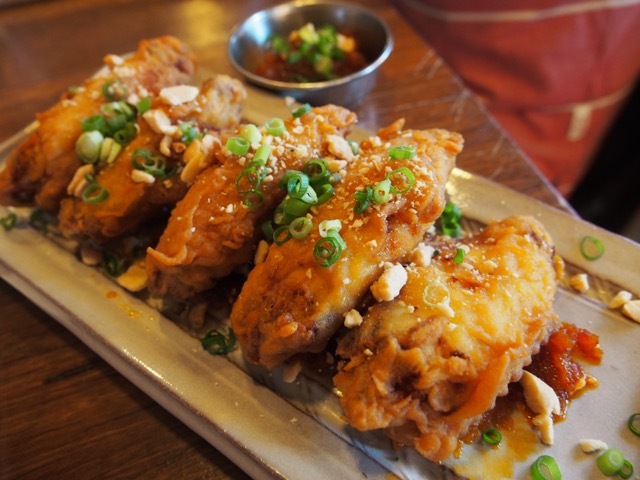 The ridiculously crispy Korean fried chicken wings ($15) came with a addictive gochujang (spicy fermented rice and soybean condiment) and peanut sauce. 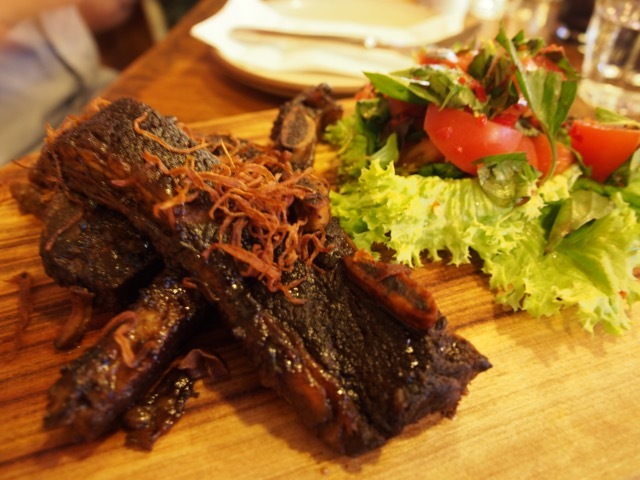 For a main, we shared Aunty Julia’s short ribs ($27) which are beef short ribs slow cooked in Indonesian sweet soy (kicap manis) with spicy tomato and basil relish. This is a large portion, and is meltingly tender and perfectly caramelised. Delicious. The salad on the side seems like a strange bedfellow though. 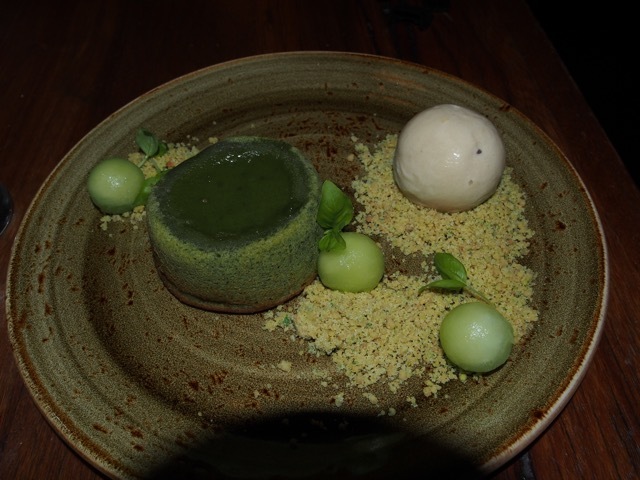 For dessert, we had the matcha and white chocolate fondant which came with basil infused honeydew melon, pistachio crumble and houjicha (Japanese roasted green tea) ice-cream ($13). The flavours complemented each other well. I’m not a fan of fondants (why do people eat uncooked batter? ), but BL loves them. S.E.A. (Southeast Asia?) 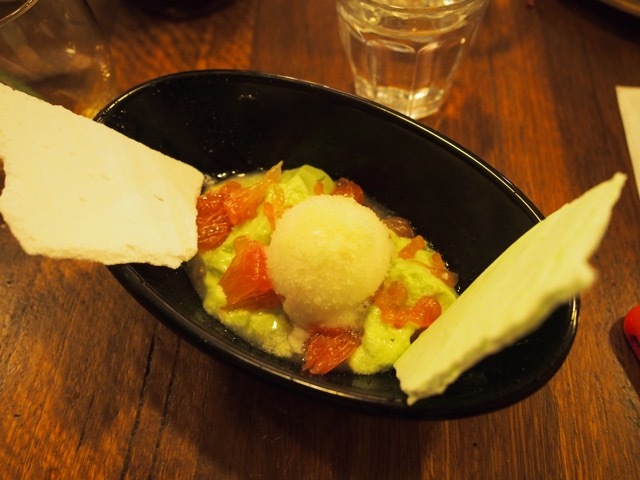 vacherin which had kalamansi curd, pandan bavarois and granita, loquat, lychee sorbet and meringue ($14). I enjoyed this; kalamansi has such a refreshing citrusy flavour, and pandan brings a mellowness to the flavour. Devon by Night is modern Asian cuisine done right. It’s exciting, beautiful to look at, and tastes amazing. I would have to rate this as one of my favourite Sydney dining experiences so far.